Every burgeoning home gym should start with a treadmill. It's the best way to offset a lifestyle based on 70-inch TV viewing, surround sound listening, gaming and a constant supply of microwaveable hamburgers. Let's be honest for a second: many home models in the past were pretty poor. Nowadays, though, you can get something very like the kind of machines you'll find in a gym. And by that I mean really swanky gyms, not the ones you get in Portuguese hotels. You will have to pay for the privilege, alas. At least £500 for something solid and into the low thousands for the really Virgin Active-style treadmills. However, with Black Friday deals and pre-Xmas sales falling just before January's ill-advised new year's resolutions, you may be able to snap up a treadmill bargain at just the right time. I reckon the Technogym Myrun is the best treadmill around today. While it's undeniably costly, it's also by far the most intelligent and technically capable running machine currently available to buy. It's also Zwift compatible, which is very handy for motivation. That isn't just down to the quality of its hardware but also the clever way it integrates apps. Its relatively compact frame is another major selling point. Of course, the TechnoGym MyRun sits at the top end of the budgetary scale – all the best stuff does, doesn't it? – but that's not to say there aren't great choices to suit less extravagant tastes. Prices range from around £160 for the really basic, self-propelled models, but these tend to offer a very unrealistic running experience, so really the sweet spot between performance and price starts at around £600. A good, mains-powered treadmill is judged on its running deck, which has to absorb the impact of a run while simultaneously representing an outdoor surface, as well as keeping the amount of noise it produces to a minimum. The cheaper the unit, the more likely you're going to hear the irritating whine of electric motors emanating from a distant room while trying to catch up with EastEnders. Naturally, the more money you spend on a treadmill, the more technology is thrown at it. So if you like tracking stats, running along with a virtual partner or ingesting some multimedia, then its worth opting for the machines with built-in screens or reliable smartphone connectivity. RRPs can be punitive but you'll found the usual online-shopping suspects tend to offer enormous discounts off sports equipment of this nature. Our price widgets will always pull in the lowest price offered by our retail chums. One final tip: sports scientists have found that runners tend to exert less energy when pounding the miles on a treadmill, presumably due to the springy running board offering an extra boost. So, if you want to keep fit indoors, much sure you place the speed on a faster setting than you think you need. This compact running machine won prestigious Red Dot and iF design awards for its small but beautifully formed exterior. An impressive quantity of features is crammed into the MyRun's svelte frame. Perhaps the killer feature is a punishing maximum incline of 12 per cent. That's great for training for fell runs and general cardio conditioning. The built-in screen gives basic run information but things gets really smart when synced up to a tablet via a built-in Bluetooth connection. From here, it's possible to relive outdoor runs via data captured from the TechnoGym App, experience a workout session that adapts to music in your library and receive detailed analysis of running style and ways to improve. The MyRun machine is also the first to feature a surface that adapts to the way you run and absorbs impact to reduce the risk of injuries without sapping power. Despite all that power, it's designed to be set up in a matter of minutes. Just follow an incredibly speedy DIY assembly process, plug it into the wall and get running. Admittedly, the price tag will be at the very top of most treadmill budgets but TechnoGym supplies its products to some of the UK's best gyms, and it knows a thing or two about how to create a realistic running experience that reduces the chance of injury and will go the distance. This machine is also Zwift compatible, which is a major plus. It is no coincidence that this lung-busting machine is named after one of the highest mountain peaks in the world, as the name of the game here is serious inclines, as opposed to all-out top speed. Crank up to a 40 per cent climb, pump the speed to 12kph and hang to the handles for dear life as you mimic sprinting up the side of Snowdonia from the comfort of your own home. The relatively small running deck might feel a little weedy compared to the mammoth machines found in your local gym, but the compact dimensions also make it a great option for those short on space. The vertical grab handles are a nice touch, as they allow for steep incline power walking with the added bonus of heart rate monitoring. The built-in speakers and workout fan are additional niceties that you could probably do without. At the other end of the spectrum to the TechnoGym machine, this is a great entry-level treadmill that'll suit many casual/skint runners just fine. Space will likely be one of the major factors in the decision for or against a treadmill at home, which is why many are designed to neatly fold flat so they can be stowed against a wall. The mains-powered Active 120 from York Fitness features an easy belt folding mechanism and wheels, so the unit can be moved around the room with minimal effort. A 1.25 horsepower motor delivers speeds of up to 16kph (just under 10mph). That's a low slower than a gym machine but a perfectly adequate pace for occasional joggers. Tech on board, includes hand sensors for an acceptably accurate heart rate read out, full LCD display and 13 preset programmes aimed at a number of fitness goals. A slim line belt could prove a problem for more portly users, however. The T-16, from popular German sportwear brand Adidas looks a bit spindly at a glance, but it actually possesses a very generous 51cm wide running deck. That's excellent considering the unit itself measures no more than 84cm in width, and means you get more space for elaborate interval training, sprints and other such cardio-based folly, without eating into precious floor area at home. The 2.75hp engine allows running speeds of up to 18km/h (11mph), which is a fairly challenging pace for most mere mortals, as well 15 levels of incline that are easily adjusted from 0 per cent to 15 per cent thanks to the multitude of buttons on the centre console. Other areas of the treadmill are a little basic, with a rather old-school digital readout, and built-in speakers that wouldn't be a substitute for your headphones even if you use the ones that came free with your mobile. Even if it's not quite as robust or clever as rivals on this list, the T-16 is still a solid, pacey offering for those looking to train hard at home. Sitting well below the TechnoGym treadmill but offering more to experienced runners than the York Fitness model, this is short on tech flourishes but excells at the basics. This hardy running machine features one of the most powerful running motors here, meaning it can sprint up to 20kph/12.4mph. The FlexSelect cushioning employs dampeners along the sides of the deck for a soft ride but unlike other machines, this can be switched off should you want a more realistic road running experience. Heart rate monitoring is possible via two Cardio-Grip sensors and the machine is fully geared up to play nicely with iFit training technology. A name that will be familiar to anyone who frequents the gym, Life Fitness produces top quality equipment that can also be introduced to the home with minimum fuss. 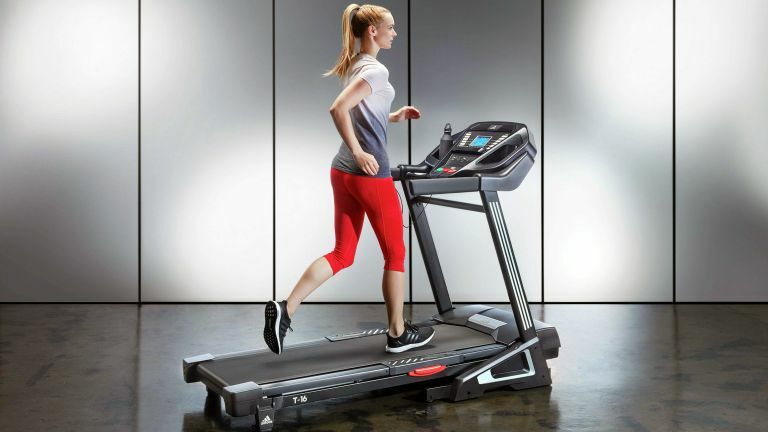 The standout feature on this model is the Track console, which easily connects to smartphones and tablets in order to harness the power of the excellent Life Fitness app. A powerful FlexDeck shock absorption system is said to reduce impact on joints by 30 per cent. As with the TechnoGym machine, it's expensive but you get what you pay for.